Quick: How many calories have you had to drink today? Can't remember? You're not alone. So long lattes, farewell soda. 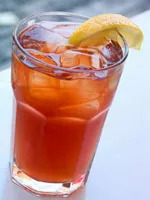 My doc recently told me to eliminate caffeine just as cool brew iced tea became my favorite way to hydrate. Drat! The silver lining? I was forced to examine my drinking habits. How many calories have you had to drink today? Can't remember? You're not alone. Many Americans don't think about it, and new research from the Johns Hopkins School of Medicine suggests we should. The weight-loss effect from cutting liquid calories was stronger than the weight-loss effect of cutting solid food calories, according to the study published in the April issue of the American Journal of Clinical Nutrition. The average American now drinks as many as 300 liquid calories daily. It's not hard to see how drink calories can pile up in a day: A 12-ounce skim latte from a coffee shop (about 100 calories), a soda to shake off the afternoon slump (about 145 calories), and a glass of Pinot Noir with dinner (121 calories) add up to 366 calories―a lot extra if you haven't planned for them. And, about that afternoon soda: If you choose a diet drink instead, it'll save you calories, but diet sodas are controversial when it comes to weight loss. Some research suggests artificial sweeteners may make you gain. Here's the flip side: You've still gotta drink something. Staying hydrated is important for your health (because of my personal experience, I'm mindful that dehydration can contribute to blood clots). We've all heard the eight 8-ounce glasses of water advice. But if you grew up as a Kool-Aid kid, like me, then you understand why a glass of cold, filtered water a few inches past the delete key is just not that appealing. I've got a thirst for flavor, even though my tastes have matured beyond Mountain Berry Punch. I've learned that good taste is hard to find—without unwanted calories. A squirt of lemon? Sometimes it works, sometimes it's just played out. Flavored water―with or without sugar substitutes―can be pricey if you're trying to drink 64 ounces a day. And I've yet to try one that's tasty enough to sip regularly. I've got a few cheap tricks, but honestly, I could use more ideas. Here are my suggestions―leave me a comment with yours! Tea time: I keep cool brew iced tea at work and put a bag in my glass of water. The flavor and aroma are enough to help me chug-a-lug, calorie free. Now I need to find a decaf variety, doc's orders. Go natural: Step beyond the squirt of lemon and make your own flavored citrus water, taken from the Four Seasons in Atlanta. In a large pitcher, combine a gallon of water with two sliced lemons and a sliced orange, and chill for 1-2 hours. Strain out the fruit after two hours. Cucumber and mint make a delicious combination, too. Low-cal cocktails: Looking for a guilt-free alcoholic drink? Check out our April issue for the scoop on shochu, a Japanese distilled liquor that has only 26 calories a shot. The 100-calorie shochu, lemon, and berry cocktail tastes awesome if you swap the red raspberries for blackberries or black raspberries. And it's not a bad calorie count when you consider other alcoholic drinks.